When I checked into my hotel room on Monday night, I found this on the table. 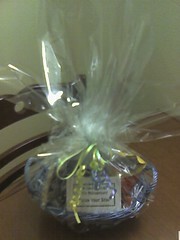 It's a little basket that came with a letter stating that I was their "Guest of the Day". It had a few mini-chocolates, a bag of corn chips, a bottle of water, and some microwave popcorn in it, plus a coupon good for $5 of phone calls. They also handed me a "computer screen brush" at the front desk, a little portable duster that pops out of a green plastic handle like a ice cream pop. Oh joy! I actually do like this hotel quite a bit, but things like this just seem a little cheesy. What! No little gold crown to wear? How do they expect you to flaunt your status over the plebs? I hope some smart-aleck at Palm is reading this and getting ideas. That would be too cool. Touche! But in that case you should have someone else pick out the musical card, etc. that will be hooked up. No fair if you know the tune ahead of time.